I live in an area of London that was once covered by a stretch of woodlands, commons, meadows and wood pasture that was called the Great North Wood. It was not the continuous wildwood which some argue had covered parts of England totally after the melting of the ice 10,000 years ago, before humans began to cut the trees down. It was known as the Great North Wood because it sat north of Croydon, a large market town fringed by chalk downlands which are not so hospitable to the kind of woodlands dominating the land to the north on London clay, namely hornbeam and sessile oak. On London’s open downlands livestock grazed and rabbits were bred for their fur and flesh. The wild but manipulated landscape of the Great North Wood would have stretched all the way north to the Thames at Deptford (where timber could be exported on ships or turned into ships), cutting off at Penge (Celt for ‘the end of the wood’) and slithering down a little like the continent of South America to Selhurst. Many of the placenames in the locality echo the woodland past, the history of its woodspeople, or the woodsman (which Ben Law neatly points out means ‘wood hand’ rather than excluding women). This can be seen most clearly by Norwood, derived from the name of the landscape itself, as well as Brockley which could describe a human settlement where badgers were notable. The ending of ‘ley’ generally means a clearing or settlement next to woodland. Honor Oak is a pointer to the Oak of Arnon Wood, a slab of probable millennia-old woodland which is now embellished by the Local Nature Reserve One Tree Hill, where the Oak of Honor stands in the form of an English oak replanted some 100 years ago after the site was saved as a public open space by dissenting locals in 1896. The lack of a ‘u’ shows that this is of the old English spelling for honour, the language taken to the Americas by settlers some centuries ago and now seeming somewhat alien or incorrect. The Great North Wood was not merely one of endless woodlands or of wildwood, it was a landscape that humans were a part of and dependent on for their livelihoods. Some of the woodlands which remain today such as One Tree Hill and Sydenham Hill Wood, have shown that they were at times more open, that larger trees stood singularly with commoners grazing their livestock on the grasses and herbaceous plants underneath the shade of trees like elm, oak, hornbeam and ash. This before the advent of the enclosures when commoners had their rights removed through an Act of Parliament, a series of events which define the landscape of my hometown to this day. As recently as the 1950’s one of the Great North Wood’s most unaffected remainders, Dulwich Wood, was grassier and more open whereas today it is darkened by holly and an array of other trees such as hornbeam, ash, hazel and rowan. 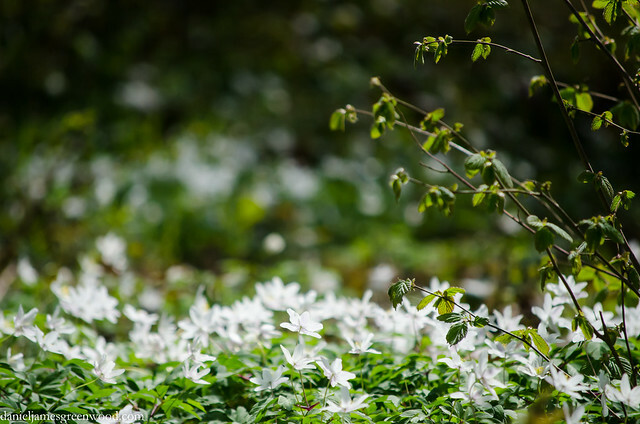 Still, the ancient remnants of the Great North Wood hold colonies of wood anemone, dog violets, wild garlic and other plants which indicate continuous woodland for at least 400 years. One of the main ways that people would have earned a living was by inhabiting the woodlands. 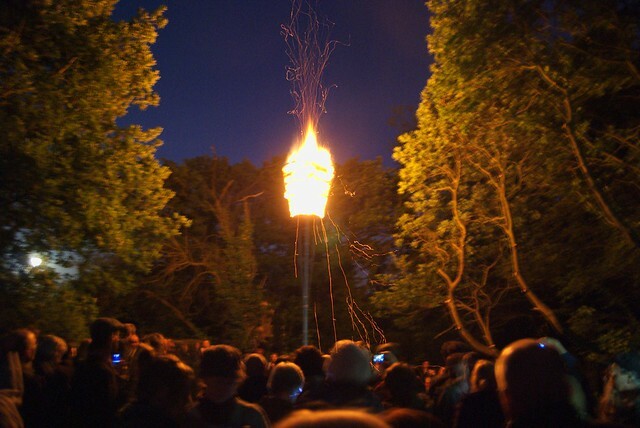 Charcoal burning was one of the most common sights and vocations in the Great North Wood. They were known as the colliers, their presence indicated by Collier’s Wood in Wandsworth, beyond the western fringes of the catchment. Hornbeam was ‘coppiced’ on a cycle of 10 or so years, the trees cut at about 20-30cm, a vigorous regrowth the next year created multiple stems and thus an eventual greater crop to be burned and sold to blacksmiths and those needing intense heat to fire their craft. 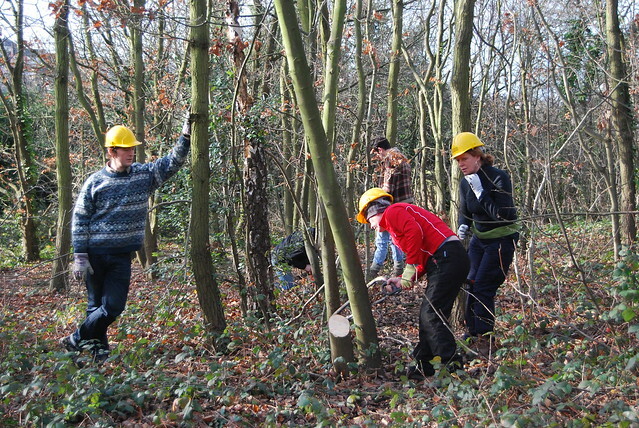 Other trees coppiced were hazel and ash, with hazel especially important for its usages for fencing and walking sticks. Sessile oaks were allowed to grow tall and true for their timber and the tannin residing in the bark. But coppicing is not necessarily as destructive or exploitative as it may sound, as when coppicing was more common – before the advent of coal and the increase in imports of cheaper fossil fuels from abroad – the Great North Wood’s coppices were home to populations of nightingales and nightjars, not least at Penge Common (now covering the famous Crystal Palace Park and the town of Anerley) where locals were said to visit at night to listen to the nightingale song, and there is some anecdotal evidence that the nocturnal music fuelled an increased birth rate. Coppicing allowed light into woods, enriching the herb layer of these woodlands, giving life to wildflowers such as dog violet which then supported the silver washed and dark green fritillary butterflies, as well as beloved primroses, now diminishing from the English landscape as ancient woodlands and hedgerows have been grubbed out and poisoned over time, feverishly in the latter part of the twentieth century. This brings me to the issue of woodlands and biodiversity offsetting, a scheme mooted by the Department for Environment Food and Rural Affairs (Defra) as a way to mitigate losses to wildlife from development. In recent times the former Transport Secretary Justine Greening advocated the ‘transplanting’ of ancient woodlands which are in the way of the proposed High Speed Rail 2 line intended to travel from London to Birmingham and then north to Manchester and Leeds in a final ‘Y’ section. More recently Environment Secretary Owen Paterson has confirmed his liking for proposals to clear ancient woodlands and plant 100 trees for every ancient tree that is lost. Both of these proposals fall flat after only a little research or, dare I say it, consideration. As Oliver Rackham puts it in his totemic ‘Woodlands’, ancient woodlands are not the place to look for ancient trees. Paterson is mistaken. What he is looking for might be something like Penge Common, or one of the other commons now gone from the Great North Wood. It is now only really in wood pasture or ancient hedge lines that you can find ancient trees. In ancient woodlands it is the landscape and ecosystem which is ancient. Paterson sells himself as a man in-tune with nature and the countryside, posing by fence posts and boasting of keeping badgers as childhood pets. His rhetoric suggests he is out of his depth. Ancient woodlands are not the place to look for ancient trees. Today ancient trees are loved, most in estates or arboretums where they are prized for their age and ‘wisdom’. In ancient woods, such is the diversity of life, many trees succumb to fungal infection, because fungi is another aspect of an ancient woodland. The life of fungi is in the soil, the mycelium, to be exact. The mycelium is, in some ways, the life force of woodland, passing nutrients back and forth between trees and soil, a little like the information superhighway I am using to publish this article. Fungi is as vital to human existence as trees, often described as ‘the third force’ after animal and plant life. So too are certain species of wildflower, insect, mammal and bird depend on ancient woodland ecosystems. We are talking about an environment that takes many hundreds of years to develop. This is why HS2 Limited’s desire to dig up the ancient woodlands (33 ancient woodlands are directly affected according to the Woodland Trust) and transplant them elsewhere is the thinking of people who should not be entrusted to decide on infrastructure projects that endanger ancient woods or natural landscapes. ‘Moving’ a woodland would not mean a big family moving from a big house to another. It would be the same as a city removing its hospitals and replacing them elsewhere without foundations or power to run the building and its infrastructure. The real point is that ancient woodlands, biodiversity, nature, these are hindrances to short-term economic gain, and in many ways, to this government’s ideological assault on the environmental sector. Biodiversity offsetting, on this level, is something those of us who love trees, woodlands and nature cannot accept or allow to occur. But what does this have to do with the Great North Wood, or of woodlands that were not necessarily valued for their biodiversity and wildlife but instead for their produce? The failure of biodiversity offsetting is its inability to recognise the need that human beings have for woodlands int he environmental sense, the importance of access to green and ‘natural’ spaces. It fails to see the importance of place, let alone wildlife or biodiversity. Worst of all it is a signifier of our failure, not just that of politicians, to see that woodlands present an opportunity for a more simple and healthier existence than the one presented to many in England today. In Ben Law’s ‘The Woodland Way’, he outlines just how far the English have moved away from their ‘forest dweller’ existence, an era that would have dated back to the Great North Wood. Woodlands offer us sanctuary, food, the resources for infrastructure, a place for real learning – wood carving, coppicing, construction, food growing, fencing, tool use – and countless creative industries. 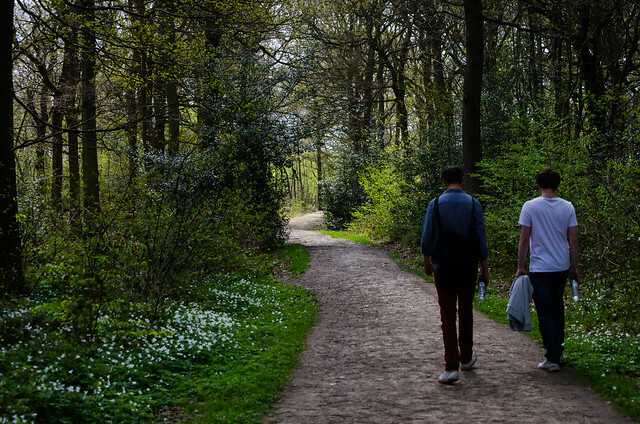 Many people express the sense of belonging offered by time spent in woodlands. The woodland sell-off plans panned (but possibly remodeled to fit biodiversity offsetting) caused outrage in the UK and led to a 500,000 strong petition being delivered to the Prime Minister David Cameron. This was a worrying time – we learned then that this government do not hold the best interest of our woodlands at heart – but the public were able to send a unified message. The sell-off was not acceptable. The Great North Wood is a case in point for people standing up for their woodlands in the shape of One Tree Hill, saved from enclosure by ‘the great agitation’, as it is known locally, when thousands rioted to protect it from enclosure. And then there is Sydenham Hill Wood, saved twice by local people, London Wildlife Trust and the Horniman Museum from plans for it to be developed for housing. I wonder how the battles would have gone if biodiversity offsetting was in place in those, both very different, times. Our woodlands are only safe when they are loved, ‘used’ and valued by local people. Sadly, it would appear that our woodlands are not merely under threat from invasive species and disease, but also from the short-termism, bravado and lack of thought from authority figures like Paterson. Though some woodlands have been around for more than 1000 years, even in a place like urban south London their national fate is at the whim of individuals looking only as far as 12 months into the future. But that is only the case if people do not speak out and challenge the ecological illiteracy of ancient woodland offsetting. Consider that the next time you walk through a wood in spring, when its wildflowers, birds and insects are flourishing around you. That place is only safe because you and the community value its sense of place. The piles of birch trunks tell us that this chalky fringe of King’s Wood has recently been coppiced. The heartwood glows golden against the black, brown and grey of a winter’s afternoon. The paths are boggy, holding the tracks of boots and the tyre marks of cyclists and scramblers. 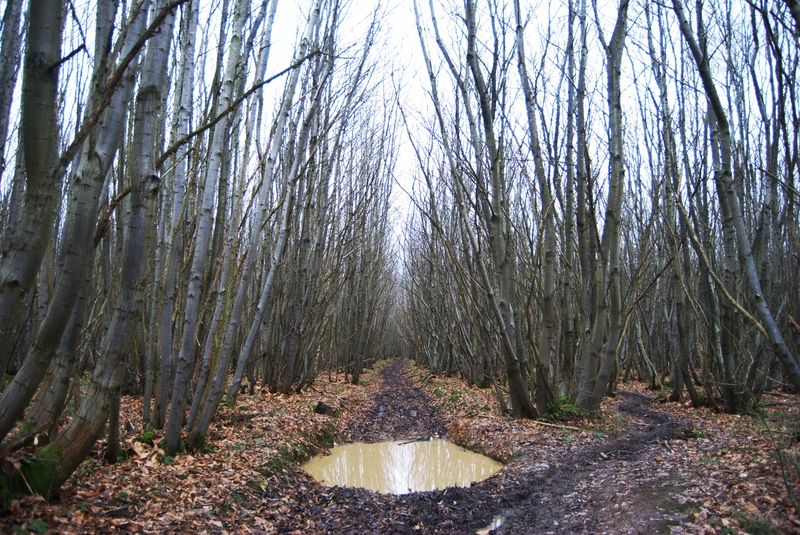 Large ditches appear at intervals, home to trees and dead wood. A Soakham Downs poster a little way back identified these as chalk pits dug in old times to extract the chalk from the soil. The chalk was then spread in the fields – what once would have been woodland – to fertilise the soil, left to weather under sun and rain. Further ahead the woodland opens in earnest, endless tracts of sweet chestnut coppice climbing into the sky. A brown puddle reflects the bare branches. Sweet chestnut provides the nuts we like to roast at Christmas, as well as forming the most economically viable form of coppicing in today’s market. The poles are cut after about five or six years and split down the middle to make chestnut paling, a type of fencing used in parks and nature reserves up and down the country. It’s another aspect of the Roman’s botanical legacy – they brought it along with them. The vertical slant of the branches is interrupted by a movement of four legged animals crossing our path in the distance. Our talking pauses as we watch an endless trail of deer move from right to left, disappearing into the trees. One of them was all white and it sticks in my mind like a puncture. We make our way towards Chilham, stopping briefly to search amongst these overgrown trees for walking sticks. We listen to the multiple stems tapping together as the wind steals through, some trees creaking. This a sound that in the endless scene of coppiced trees we mistake for shrill and distant calls of people.